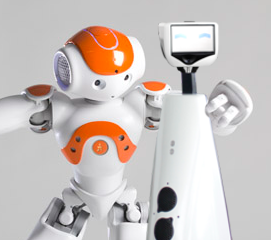 Nao, meet Jazz. Jazz, Nao. Recent news from our friends in France, Jean-Christophe Baillie has found himself partnering with the wizards of Aldebaran through an acquisition of all tech, talent and software. JC has taken the role of Chief Science and Technology Officer, bringing his skill to augment the Aldebaran product offering. From the press release, it sounds like this acquisition was to strengthen both players – Aldebaran for the software and market availability into telepresence that GOSTAI could offer and GOSTAI gets a long running partner brand that can share in talent, tech and overall market resources and distribution. So, we have InTouch partnering with iRobot – which offers protection to both players in terms of patent protection and market entry (iRobot into telepresence and medicine). Then we have Aldebaran with GOSTAI – potentially for a similar situation. What next – will Adept purchase Giraff? Suitable purchase Anybots? This entry was posted in GOSTAI, Jazz Connect, Jean-Christophe Baillie, Remote Presence News, Remote Presence Systems, RPS Companies and tagged Aldebaran, GOSTAI, GOSTAI Jazz, Jean-Christophe Baille, Nao. Bookmark the permalink.